PennsylvAsia: Cremation Ceremony of King Bhumibol, October 26 at Carnegie Mellon University. 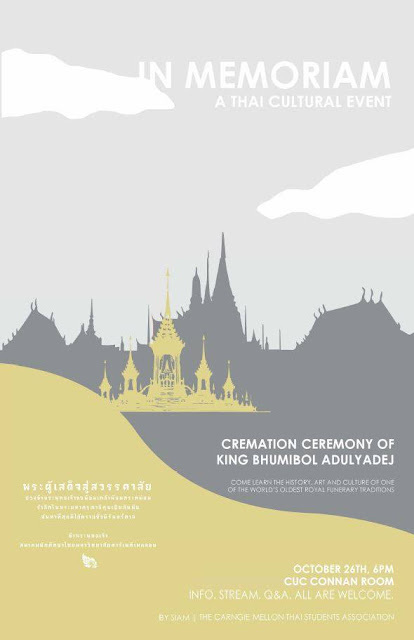 Cremation Ceremony of King Bhumibol, October 26 at Carnegie Mellon University. SIAM - CMU Thai Students Association will host a ceremony marking the cremation of the late King Bhumibol Adulyadej of Thailand on October 26. His Majesty the beloved King Bhumibol Adulyadej of Thailand passed away on October 13, 2016. His Majesty has worked tirelessly on several projects all over the kingdom throughout his life for the betterment of his people. His countless accomplishments and teachings will forever be remembered. The cremation of the Late King is happening on October 26, 2017 in Thailand. SIAM will be hosting an event on CMU campus for those of us away from home but would like to pay respect to the King. Please dress respectfully to the event. The exhibition will be open from 5:30 to 8:00pm. There will be a presentation about the cremation ceremony at 6:00pm presented by SIAM Thai members. The event will be held in the Connan Room of the Jared L. Cohon University Center (map) from 5:30 pm.